I like the convenient location and the accommodating staff. Jessica and the staff were super nice. I appreciate their hospitality. Clean and nice stay, staff was friendly. Short walk to the galleria and other shops and things to do. The staff was extremely helpful and the lobby was well laid out. The Restaurant was FANTASTIC. Would definite recommend staying here. The suite was very spacious. The bar closed too early though. Friendly residents of the biggest city in Texas are ready to greet you with a big smile and local tales of their thriving homeland. They know H-Town is a premier destination for corporate and vacation travelers, offering a cosmopolitan experience that encompasses thriving energy corridors and lush acres of urban green. This is a city that rolls out the welcome mat with a unique style, and Houston hotels especially reflect the legendary Texan hospitality. The pace is exciting, but not demanding. The attitude is metropolitan, but you can leave the black tie at home. You're staying in a big town with a well-deserved reputation for serving up the very best: from barbecue cook-offs and gourmet dining, to professional sports and a world-class museum district. This downtown jewel is your gateway to hiking and biking in the great urban outdoors. Try your angling luck at Kinder Lake, attend local canine competitions on Jones Lawn, and cool down in the Houston summer with a splashdown in sparkling Gateway Fountain. Take a leisurely stroll through Hermann Park, and explore the 20 museums that grace this remarkable district. The Museum of Fine Arts and Menil Collection are world-renowned centerpieces in this enclave that includes venues dedicated to science, photography and contemporary crafts. Relive the history of mankind's giant leap through the Starship Gallery, and launch your astronaut dreams inside the Apollo 17 Command Module. JSC thrills big kids with its NASA Tram Tour and entertains the little ones with their own Kids' Space Place. Pure Texas fun bucks into town every March with three weeks of professional rodeo action, star-studded musical entertainment and the World's Championship Bar-B-Que Contest. Follow that delicious aroma to Reliant Stadium, and saddle up for a tasty ride. Some traditions just can't be explained, so you have to experience this incredible parade for yourself. The springtime street regatta celebrates Houston's eccentric relationship with cars, its love of creative art and the home-grown imagination that elevates both to delightfully entertaining heights. It's impossible to set your sights too high at this breathtaking air show over Houston's historic Ellington Field. The Air Force Thunderbirds and Navy Blue Angels roar through clear April skies in precise formations and rock the clouds with aeronautical acrobatics. This vibrant area is more than an ideal location for business travelers. 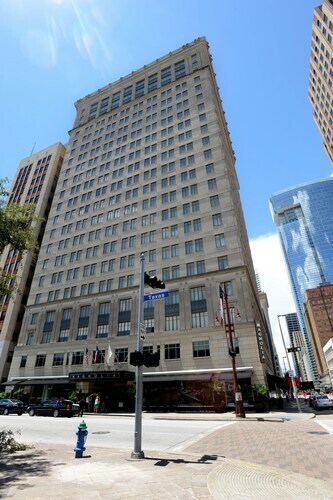 All the front doors in downtown Houston hotels lead out to upscale dining, local sports venues and a thriving theater district. The venerable Magnolia Hotel and historic Lancaster Hotel are popular favorites. Rub shoulders with the uptown crowd, and indulge in sophisticated shopping at the River Oaks Center. This elegant slice of Houston offers an enticing array of accommodations, from beautiful boutique hotels to the luxurious Marriott West. Swing through Rice University, catch the games at NRG Stadium, and head on south to Galveston. A variety of national hotel icons, comfortable price ranges, and convenient access to downtown keep this area high on the list of preferred stays for all travelers. Houston summers really sizzle, so locals turn staying cool into a sport. This time of year, they'll invite you to catch an Astros game at Minute Maid Park where the roof stays closed and the AC stays on. The city's tunnel system is an underground urban world of shopping and dining fun. It's a favorite place to duck the heat with easy connections to downtown Houston. This big town plans city celebrations around its beautiful spring weather, and the Texans tackle NFL gridiron at NRG Stadium every fall. If you're weary of freezing winters, join the flock of fellow travelers who proudly call themselves snow birds as they head south to Houston for a balmy Christmas. Note: Average nightly rates based upon 3 star hotel bookings on orbitz.com from October 2017 to September 2018. Loved the community table and the great tasting chocolate chip cookies in the lobby. Room was very quiet and comfortable. Could hardly be happier. Very nice and comfortable room. The pillows were so comfortable I'm buying a set of the same ones. Only possible complaint would be the $30 a day for overnight parking...the second night I just parked in the lot across the street and it was fine. 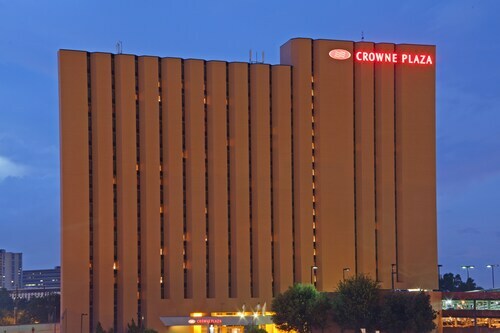 ,Convenient parking , no elevator delays, great breakfast buffet, very friendly staff.